It’s one of the most famous opening chords in rock music, and it plays over the most famous opening shot in rock film: three of The Beatles, smiles on their faces, fleeing a crowd of adoring fans as they try to make a train. The song and the film share a title, A Hard Day’s Night, derived from a phrase tossed off by drummer Ringo Starr, one that twists the meaning of common words all the way back around to the point where they start making sense again. And both that title and the chord contain their own seeming contradictions. The words confuse day and night. The chord, as described by Bob Spitz in his group biography The Beatles, is “a G7, with an added ninth and a suspended fourth, so unique that it is considered neither major nor minor.” For the moment it hangs in the air before the rest of the song begins, it’s hard to know what to expect. In spite of the smiles, that thrum sounds a bit ominous. 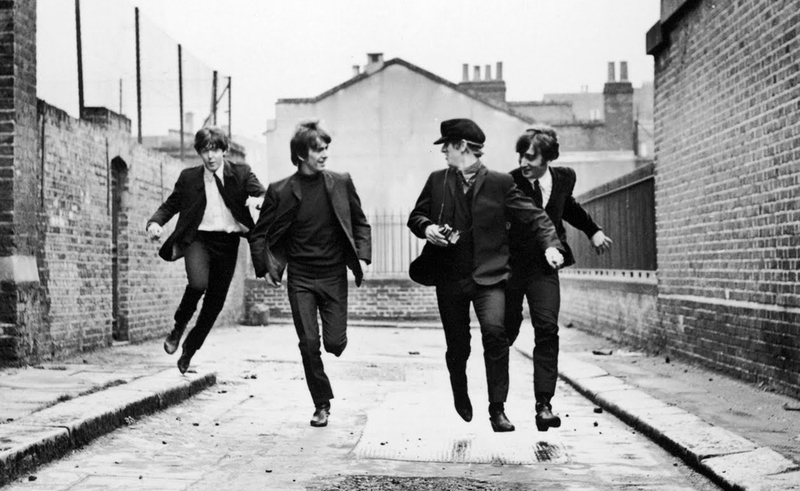 Then the rest of the song kicks in, and the opening of A Hard Day’s Night reveals itself as a pure expression of joy, one that asks viewers to identify not with the stars of the movie, but with the people chasing them. The pleasure comes from the rush of the music and the image, but also, to borrow another title, from being with The Beatles. It isn’t the last contradictory moment, though. A Hard Day’s Night finds the band reveling in its then-new fame while trying to escape it, if only for a few moments at a time. John, Paul, George, and Ringo cast a skeptical eye at the machinery of stardom, but they never seem cynical about what it means to be The Beatles in 1964, and never do anything to give those screaming throngs any reason to grow disillusioned with their idols. The music is as pure as the motives of the people making it: young men, just a few years older than the audiences they’re working into a frenzy, who want nothing more than to express themselves and please the crowd. It’s just the rest of the world, with its endless questions and demands, that keeps getting in the way. That conflict is at the heart of A Hard Day’s Night, and in many ways, it surrounds the film itself. A Hard Day’s Night began as a quickie attempt to cash in on Beatlemania before its frenzy faded, but no one involved in the film seemed interested in creating the crass product they might easily have gotten away with making. Instead they made a film in which The Beatles escape every attempt to package and contain them, ducking their management, hitting the clubs when instructed to stay in and answer mail, slipping out to frolic to the accompaniment of “Can’t Buy Me Love,” and deflecting inane questions with witty non-answers. (“Arthur.”) It’s fitting that the film’s final image is of Beatles photos covered in phony autographs falling to the Earth, while the Beatles themselves ascend in a helicopter. The real thing remains untouched and untouchable. It somehow seems fitting that all this takes place in a movie that still perfectly served the needs of those looking to exploit the popularity of The Beatles. Momentum would likely have been enough to make the movie a hit, but just as the band remained restless and inventive with its music, the film similarly refuses to coast. For A Hard Day’s Night to be a hit in 1964, it had to do little more than showcase The Beatles performing at feature length. It over-delivered, winning over even those not already inclined to enjoy a Beatles movie—like the New York Times’ Bosley Crowther, who by 1964, wasn’t readily inclined to embrace new trends. Though noting “the frequent and brazen ‘yah-yah-yahing’ of the fellows when they break into song may be grating,” Crowther offered favorable comparisons to the Marx brothers, and noted the film was “much more sophisticated in theme and technique than its seemingly frivolous matter promises.” There was something happening there, even if he didn’t know what it was. And then, after all that: this. It isn’t just the newness of The Beatles on evidence in A Hard Day’s Night, though. To translate the spirit of the music to film, director Richard Lester found visuals to match the sound, using handheld camera work, putting together compositions seemingly on the fly, breaking reality for absurdist humor, and editing it with a snappiness that suited the songs. Born in Philadelphia, Lester had worked in British television since 1953. Like John Frankenheimer, Robert Altman, and other directors who learned their craft in television on the other side of the Atlantic, Lester brought in tricks born of low-budget necessity to give a striking immediacy to his feature work. He also kept an eye across the English Channel, noting the developments of the French New Wave, and incorporating some of its methods into his repertoire. But it was Lester’s association with members of The Goon Show, a British radio institution, that helped win him the job. The Beatles had grown up with the Goons, whose humor was woven into the band members’ sensibilities. Lester, working with the Goons’ Peter Sellers and Spike Milligan, had made the visually inventive “The Running Jumping & Standing Still Film,” and that no doubt helped seal the deal. Lester only made two features before A Hard Day’s Night, the comedy sequel Mouse On The Moon and It’s Trad, Dad! (a.k.a. Ring-A-Ding Rhythm), the latter a showcase for British trad jazz and American rock and R&B artists (including Beatles hero Gene Vincent). In retrospect, It’s Trad, Dad! looks a bit like a warm-up for A Hard Day’s Night. Lester takes a straightforward assignment—let some acts do their thing and tie it together as simply as possible—and keeps pushing against its boundaries. As future efforts like the Palme D’or-winning The Knack… And How To Get It! attest, like The Beatles, Lester had no interested in being contained. And like Lester, The Beatles avoid getting placed into neat boxes, even as they’re playing fictionalized versions of their own stereotypes. Screenwriter Alun Owen spent two days with the band in Dublin, then extrapolated from his time with them, tailoring their parts to their personalities, and giving them short exchanges, the better to hide their inexperience in case they couldn’t act. As it turned out, they could—or they could at least play even cooler versions of themselves, thanks to Owen’s witty script, which made everyone else around them seem that much duller by comparison. Almost everyone, that is. As Paul McCartney’s “clean” Irish grandfather, Wilfrid Brambell—who would have been instantly recognizable to British audiences at the time for his starring role in Steptoe And Son, the British sitcom later adapted as Sanford And Son—seems as wily as the four Beatles. He even gets the better of poor Ringo, with almost disastrous consequences. He’s the sharpest of the older-generation figures who keep getting in The Beatles’ way, from their traveling companion to the advertising executive to their management to the drippy reporters to the man who doesn’t like them running about in his field. The Beatles begin the film running from their fans, and spend the rest of it dodging other forces that keep trying to catch them. They evade every trap, though. While when we’re watching the film now, we know the real-life Beatles couldn’t manage that kind of nimble escape. The group’s remarkable run ended just six years later, undone in part by the forces they mock here. But it’s still pure joy to watch them slip away. “We’re out!” Ringo shouts as they exit through a fire escape, just before “Can’t Buy Me Love” kicks in. In that moment, it feels like he’s right. Tomorrow, our Movie Of The Week Forum explores how A Hard Day’s Night works with style, music, celebrity, and teen culture. Then on Thursday, Noel Murray talks about the post-Beatles Beatle movies of the 1970s.